Effective Team Leadership: A Summary of "Strategies of Effective New Product Team Leaders"
A. Jassawalla and H. Sashittal, "Strategies of Effective New Product Team Leaders," California Management Review, vol. 42, no. 2, pp. 34-51, Winter 2000. Published in the Winter of 2000 volume of California Management Review, A. Jassawalla and H. Sashittal’s article titled “Strategies of Effective New Product Team Leaders” presents a process for team leader transformation aimed at improving new product development (NPD). Traditional NPD literature provides team leaders with guidance on what they should do to be effective. The literature and main-stream training provides NPD team leaders with a toolbox of “do this and you will reap the rewards” type strategies. Many of these tools include “soft” skills such as effective communication, human side interaction, and conflict resolution. Jaswalla and Sashittal believe that simply knowing the best practices of NPD team leadership isn’t enough to guarantee successful new product development. Team leaders and Senior Managers alike, must commit to developing critical interpersonal skills which companies tend to overlook. The authors present a new process of team leadership which includes effective ways to mitigate typical environmental forces encountered in NPD. The article provides helpful strategies for interpreting these forces, developing action plans, and examples of actions team leaders take to help transform their teams. Jaswalla and Sashittal present the key finding of their study; five key milestones as well as environmental forces with corresponding objectives and strategies employed by effective team leaders. These objectives and strategies are necessary for team transformation and rapid new product development. Often NPD decisions are driven by a controlling R&D department. In this environment, NPD is hampered due to a sequential development process and disconnected team members. Because R&D often plays a dominating secretive role, critical input from other functional team members may not be sought after or volunteered. Because of these factors, other functional groups may not really feel committed to the development process. Jaswalla and Sashittal found that the most effective team leaders actively developed relationships with key department heads in other functional areas. By actively engaging the other key functional groups, disseminating information to the entire team, and holding each member accountable for input into the team as well as their own output, effective team leaders ensure commitment from the entire NPD team. In general, I agree with the authors’ analysis. However depending on the organizational structure of the company, obtaining commitment and holding members accountable might be very difficult. I’ve seen cases where members are committed to the team but their functional area managers may not be as open to accepting responsibility for NPD delays. Jaswalla and Sashittal found that in order to have rapid decision making in new product development, information must be shared openly with the team. Effective leaders eliminate information that is hard to understand or explain. These leaders boost communication through increased meetings, the collation of information, and in some cases physically co-locating key members. Personally, I think establishing the proper level of communication is difficult. The solutions presented by the authors may not work for some organizations and teams. For example, increasing the frequency of meetings may actually hamper R&D as engineers may be stuck in meetings all day. The most effective leaders studied viewed themselves as facilitators, striving to minimize bureaucratic forces which can hinder team performance. They serve behind the scenes to seek out members with the best set of skills and talents. They focus on human interaction to help bring together the right mix of team members. The study showed that by focusing on human interaction, team leaders were able to foster more effective communication and information sharing within the team. Finally, the most effective leaders have a deep interest in change and risk taking. They focus the team on learning, supporting risky ideas and innovative actions. Effective team leaders allow members to have autonomy and the freedom to make their own mistakes. In my opinion, trying new things and taking risks is good but team leaders should call “time out” if they see a potential risk being taken which could lead to major NPD slippage. Risks should be taken, but the impact of potential failures must be well understood by the team. S. Zhang et al. (2005) provide useful strategies for developing virtual team leaders. Three often over looked factors were analyzed: media richness of communication technology, goal-frustrating events and leader-follower gender. The authors propose that media richness of communication provides a conduit by which team leaders inspire team performance. S. Zhang et al. provide team leaders with motivational strategies for dealing with goal setbacks. This paper proposes that female leaders add a certain level of charisma and social-emotional skills which can improve virtual team performance . Thamhain (2007) reiterates many of the attributes of effective team leaders discussed in this article as well as some other important factors. The author stresses the importance of personal and professional needs of team members. If the goal of the team helps fulfill personal and professional needs of its members, commitment tends to follow and the overall performance of the team benefits . Assmann and Gallenkamp (2009) explored the topic of communication team leader trustworthiness in virtual teams. Building trust is an important task of the team leader, which was discussed in this brief. However, building trust across different cultures in a virtual team setting presents many challenges. Assmann and Gallenkamp highlighted the need for team leaders to understand the influence culture, self-disclosure, and communication media has on perceptions of trustworthiness of the team leadership of virtual teams . This article certainly points to the root cause of many delays in new product development. In order to be successful, teams need committed functional members who feel they are a major part of the development team. Team leaders must work to improve communication and remove “hidden agendas” and other barriers. Team leaders are possibly the most important members of new product development teams. The insights presented in this article are essential for effective team leadership. Companies invest heavily in training team leaders on traditional “tools of the trade”. However, arguably more important is training and development in the “soft” skills presented in this article. Many companies drastically overlook the importance of these skills and thereby miss an opportunity to create more effective teams and speed new product development. S. Zhang et al., "Leadership Styles in Virtual Team Context: Limitations, Solutions, and Propositions," presented at Proceedings of the 38th International Conference on System Sciences, Hawaii, 2005. H. Thamhain, "Leadership Lessons from Managing Technology-Intensive Teams," presented at PICMET 2007 Proceedings, Portland, Oregon, 2007. J. Assmann, J. Gallenkamp, "Communication and Leadership Trustworthiness in Virtual Teams: An Empirical Comparison of the US and China," presented at Proceedings of the 42nd International Conference on System Sciences, Hawaii, 2009. 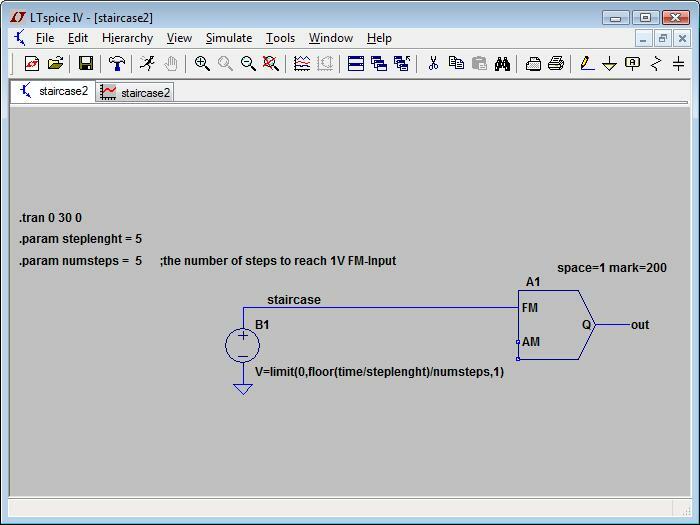 Here is a simple FM modulator driven by a staircase voltage. 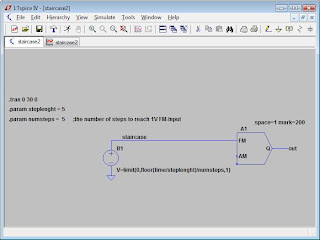 This FM modulator can be used as a signal source for simulating an FM amplifier or other circuit. NOTE: This modulator was obtained from the LTSpice Yahoo! group. I did not develop this schematic. This schematic was posted by the user "Petzen". Here is a up to date list of Portland area channels. Here is a quick link budget calculator.